The Oakland Athletics (often abbreviated to Oakland A′s) are a professional baseball team based in Oakland, California. The Athletics are a member of the Western Division of Major League Baseball's American League (AL). The Athletics have played in the Oakland Coliseum since moving to Oakland in 1968. Overall, the A's have won nine World Series championships, the third-highest total in Major League Baseball (trailing only the New York Yankees and the St. Louis Cardinals). The "Athletics" name originates from the late 19th century "athletic clubs", specifically the Philadelphia Athletics baseball club. They are popularly nicknamed "the A's", in reference to the Gothic script "A", a trademark of the team and the old Athletics of Philadelphia. They are also known as "the White Elephants" or simply "the Elephants", in reference to then-New York Giants' manager John McGraw's calling the team a "white elephant". This was embraced by the team, who then made a white elephant the team's mascot, and often incorporated it into the logo or sleeve patches. During the team's 1970s heyday, management often referred to the team as The Swingin' A's, referencing both their prodigious power and to connect the team with the growing disco culture. One of the American League's eight charter franchises, the club was founded in Philadelphia, Pennsylvania, in 1901 as the Philadelphia Athletics. The team had some prominent success in Philadelphia, winning three of four World Series from 1910 to 1913 and two in a row in 1929 and 1930. The team's owner and manager for its first 50 years was Connie Mack, and its Hall-of-Fame players included Chief Bender, Frank "Home Run" Baker, Jimmie Foxx, and Lefty Grove. After two decades of decline, however, the team left Philadelphia for Kansas City in 1955 and became the Kansas City Athletics. After 13 mostly uneventful seasons in the Midwest, the team moved to Oakland in 1968. There a dynasty soon emerged, with three World Championships in a row from 1972 to 1974 led by players including Catfish Hunter, Reggie Jackson, ace reliever Rollie Fingers, and colorful owner Charlie O. Finley. After being sold by Finley to Walter A. Haas, Jr., the team eventually won three consecutive pennants and the 1989 World Series behind the "Bash Brothers", Jose Canseco and Mark McGwire, as well as Hall-of-Famers Dennis Eckersley and Rickey Henderson. In more recent years, the A's have often been playoff contenders but have not returned to the World Series since 1990. In 2002, the Athletics won 20 games in a row, which broke an American League record, as shown in the film Moneyball. The movie, and the book from which the movie was derived, showcased how the A's were able to compete and thrive despite their financial limitations. After New York Giants manager John McGraw told reporters that Philadelphia manufacturer Benjamin Shibe, who owned the controlling interest in the new team, had a "white elephant on his hands," Mack defiantly adopted the white elephant as the team mascot, and presented McGraw with a stuffed toy elephant at the start of the 1905 World Series. McGraw and Mack had known each other for years, and McGraw accepted it graciously. By 1909, the A's were wearing an elephant logo on their sweaters, and in 1918 it turned up on the regular uniform jersey for the first time. Over the years the elephant has appeared in several different colors. It is currently white. The elephant was replaced as the team mascot in 1963 by then-owner Charles O. Finley in favor of a Missouri mule (it was also rumored to have been done by Finley in order to attract fans from the then heavily Democratic constituents of Missouri by replacing the traditional Republican mascot to one associated with Democrats). In 1988, the elephant was restored as the symbol of the Athletics and currently adorns the left sleeve of home and road uniforms. The elephant mascot returned briefly in the mid-'80s, under the name Harry Elephante. In 1997, the elephant returned, taking its current form, Stomper. Currently, the team wears home uniforms with "Athletics" spelled out in script writing and road uniforms with "Oakland" spelled out in script writing, with the cap logo consisting of the traditional "A" with "apostrophe-s." The home cap is green with a gold bill and white lettering, while the road cap, debuting in 2014, is all green with "A's" in white with gold trim. Regardless of road or home games, the batting helmets used are green with gold brim. 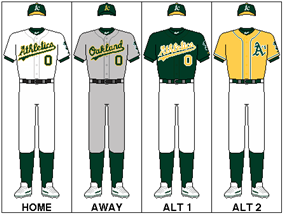 From 1994 until 2013, the A's wore green alternates jerseys with the word "Athletics" in gold. It was used on both road and home games. During the 2000s, the Athletics introduced black as one of their colors. They began wearing a black alternate jersey with "Athletics" written in green. After a brief discontinuance, the A's brought back the black jersey, this time with "Athletics" written in white with gold highlights. Commercially popular but rarely chosen as the alternate by players, in 2011 they were replaced by a new gold alternate jersey with "A's" in green on the left chest. With the exception of several road games during the 2011 season, the Athletics' gold uniforms are used as the designated home alternates. A green version of their gold alternates was introduced for the 2014 season to replace their previous green alternates. The new green alternates feature the piping, "A's" and lettering in white with gold trim. The nickname "A's" has long been used interchangeably with "Athletics," dating to the team's early days when headline writers wanted a way to shorten the name. From 1972 through 1980, the team nickname was officially "Oakland A's," although, during that time, the Commissioner's Trophy, given out annually to the winner of baseball's World Series, still listed the team's name as the "Oakland Athletics" on the gold-plated pennant representing the Oakland franchise. According to Bill Libby's Book, Charlie O and the Angry A's, owner Charlie O. Finley banned the word "Athletics" from the club's name because he felt that name was too closely associated with former Philadelphia Athletics owner Connie Mack, and he wanted the name "Oakland A's" to become just as closely associated with him. The name also vaguely suggested the name of the old minor league Oakland Oaks, which were alternatively called the "Acorns." New owner Walter Haas restored the official name to "Athletics" in 1981, but retained the nickname "A's" for marketing purposes. At first, the word "Athletics" was restored only to the club's logo, underneath the much larger stylized-"A" that had come to represent the team since the early days. 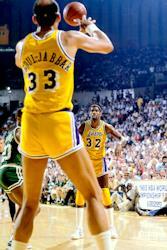 By 1987, however, the word returned, in script lettering, to the front of the team's jerseys. Although official capacity was stated to be 43,662 for baseball, seats were sometimes sold in Mount Davis as well, pushing "real" capacity to the area of 60,000. The ready availability of tickets on game day made season tickets a tough sell, while crowds as high as 30,000 often seemed sparse in such a venue. On December 21, 2005, the Athletics announced that seats in the Coliseum's third deck would not be sold for the 2006 season, but would instead be covered with a tarp, and that tickets would no longer be sold in Mount Davis under any circumstances. That effectively reduced capacity to 34,077, making the Coliseum the smallest stadium in Major League Baseball. As of 2008, sections 316–318 are the only open third-deck sections for A's games, bringing the total capacity to 35,067. The Athletics are the only remaining MLB team still sharing a stadium with an NFL team on a full-time basis. However, Toronto's Rogers Centre is shared by the Blue Jays and the Canadian Football League's Toronto Argonauts, and is also used by the Buffalo Bills for one regular season game on annual basis and a biannual preseason game. Since the mid-2000s the A's have been in talks with Oakland and other Northern California cities about building a new baseball-only stadium. 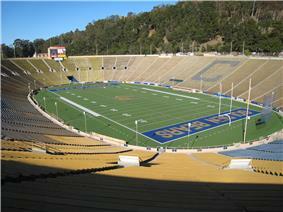 One planned stadium, Cisco Field, was originally intended to be built in Fremont, California (a location that has since been abandoned). There were talks about it remaining in Oakland and there are currently talks about building it in San Jose. Additionally there have been some proposals about moving the team to Sacramento and renovating that city's minor league stadium. If negotiations within the Bay Area fail, Sacramento is considered a possible destination for the team. Sacramento was the home of the team's AAA affiliate, the River Cats. The River Cats' stadium, Raley Field, would need to increase seating capacity to accommodate a major league team. The River Cats are now affiliates of the San Francisco Giants, making the market exclusive to the Giants, much like San Jose. In 2009, the City of San Jose attempted open negotiations with the team regarding a move to the city. Although parcels of land south of Diridon Station would be acquired by the city as a stadium site, the San Francisco Giants' claim on Santa Clara County as part of their home territory would have to be settled before any agreement could be made. By 2010, San Jose was "aggressively wooing" A's owner Lew Wolff. Wolff referred to San Jose as the team's "best option," but Major League Baseball Commissioner Bud Selig said he would wait on a report on whether the team could move to the area because of the Giants conflict. In September 2010, 75 Silicon Valley CEOs drafted and signed a letter to Bud Selig urging a timely approval of the move to San Jose. In May 2011, San Jose Mayor Chuck Reed sent a letter to Bud Selig asking the commissioner for a timetable of when he might decide whether the A's can pursue this new ballpark, but Selig did not respond. The Bay Bridge Series is the name of a series games played between (and the rivalry of) the A's and San Francisco Giants of the National League. The series takes its name from the San Francisco – Oakland Bay Bridge which links the cities of Oakland and San Francisco. Although competitive, the regional rivalry between the A's and Giants is considered a friendly one with mostly mutual companionship between the fans, as opposed to White Sox–Cubs, or Yankees–Mets games where animosity runs high. Hats displaying both teams on the cap are sold from vendors at the games, and once in a while the teams both dress in uniforms from a historic era of their franchises. Originally, the term described a series of exhibition games played between the two clubs after the conclusion of spring training, immediately prior to the start of the regular season. It was first used to refer to the 1989 World Series in which the Athletics won their most recent championship and the first time both teams had met since they moved to the San Francisco Bay Area. Today, it also refers to games played between the teams during the regular season since the commencement of interleague play in 1997. Through July 10, 2014, the A's have won 53 games, and the Giants have won 47 contests, and the A's have held their head-to-head edge in this interleague matchup for the past 11 years. The A's also have edges on the Giants in terms of overall postseason appearances (18 to 11), division titles (16 to 8) and World Series titles (4 to 3) since both teams moved to the Bay Area. The A's and Royals rivalry was more noticeable back in the 1970's and 1980's when they battled for the AL west. But now in 2014 the rivalry is well known. The A's lost the 2014 Wild Card game to a Salvador Perez single in the 12th inning, a game that some consider to be the most thrilling game in baseball history. The City Series was the name of a series of baseball games played between the Athletics and the Philadelphia Phillies of the National League that ran from 1903 through 1955. After the A's move to Kansas City in 1955, the City Series rivalry came to an end. The teams have since faced each other in interleague play (since its introduction in 1997) but the rivalry has effectively died in the intervening years since the A's left Philadelphia. The Athletics have retired six numbers, and honored one additional individual with the letter "A". 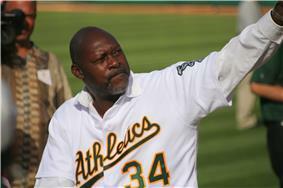 Fourteen members of the Athletics organization have been honored with induction into the Bay Area Sports Hall of Fame. The Athletics have made no public recognition of Philadelphia Athletics players at their stadium. From 1978 to 2003 (except 1983), however, the Philadelphia Phillies inducted one former Athletic (and one former Phillie) each year into the Philadelphia Baseball Wall of Fame at the then-existing Veterans Stadium. Twenty-five Athletics have been honored. In March 2004, after Veterans Stadium was replaced by the new Citizens Bank Park, the Athletics' plaques were relocated to the Philadelphia Athletics Historical Society in Hatboro, Pennsylvania, and a single plaque listing all of the A's inductees was attached to a statue of Connie Mack that is located across the street from Citizens Bank Park. Connie Mack, Jimmie Foxx, Lefty Grove, and Mickey Cochrane have also been inducted into the Philadelphia Sports Hall of Fame. 2012 94 68 .580 1st in AL West Lost ALDS vs. Detroit Tigers, 2–3. 2013 96 66 .593 1st in AL West Lost ALDS vs. Detroit Tigers, 2–3. 2014 88 74 .543 2nd in AL West Lost ALWC vs. Kansas City Royals, 8–9. The 2003 The New York Times Best Seller list for 18 consecutive weeks, peaking at number 2. In 2011, Columbia Pictures released the film based on Lewis' book, which featured Brad Pitt playing the role of Beane. On September 19, 2011, the US premiere of Moneyball was held at the Paramount Theare in Oakland, which featured a green carpet for attendees to walk, rather than the traditional red carpet. In The Simpsons episode, Regarding Margie, Homer Simpson writes "74 Oakland A's - Best Team Ever" on the curb in front of his house, just as a car featuring 5 members of the 1974 Athletics is driving by. Former Athletics Sal Bando and Gene Tenace voice themselves in the episode. ^ Grauley, S.O., Why the Athletics Are Called "White Elephants" (excerpt from the 1909 Philadelphia A's Souvenir Program). Philadelphia Athletics Historical Society official website. Retrieved September 23, 2010. ^ "Cashman Field | Las Vegas 51s Cashman Field". Web.minorleaguebaseball.com. Retrieved 2013-08-18. ^ Leavitt, Parker (October 24, 2014). "Mesa's Hohokam Stadium ready for Oakland A's". The Arizona Republic. Retrieved 1 December 2014. ^ Dennis, Rob (December 30, 2011). "Fremont mayor Bob Wasserman dead at 77". ^ "San Jose officials move into action, hoping to woo A's – San Jose Mercury News". Mercurynews.com. Retrieved 2013-08-18. ^ Layer, Marine (March 7, 2009). "How to Expand a Minor League Park". Retrieved May 3, 2010. ^ "Plans for A's stadium in San Jose moving forward". USA Today. June 16, 2010. ^ "How the A's ballpark plans stack up – San Jose Mercury News". Mercurynews.com. Retrieved 2013-08-18. ^ "75 Silicon Valley leaders endorse A's move to San Jose – San Jose Mercury News". Mercurynews.com. Retrieved 2013-08-18. ^ "In case you forgot, the Athletics are still in franchise limbo | HardballTalk". Hardballtalk.nbcsports.com. Retrieved 2013-08-18. ^ "San Jose Inside – Selig Talks About A's Move to San Jose". Sanjoseinside.com. Retrieved 2013-08-18. 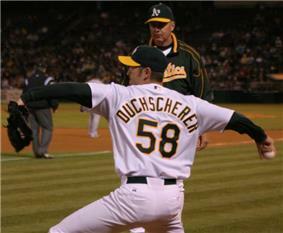 ^ "San Jose sues MLB over A's vote". Espn.go.com. 2013-06-19. Retrieved 2013-08-18. ^ "Head-to-Head record for Oakland Athletics against the listed opponents from 1997 to 2012". baseball-reference.com. Sports Reference LLC. ^ Burgoyne, Tom (2004). Movin' on Up: Baseball and Phialdephia Then, Now, and Always. B B& A Publishers. p. 128. ^ For photos of the A's Wall of Fame plaques, see Philadelphia A's Society Museum and Library webpage. Philadelphia Athletics Historical Society. Retrieved September 23, 2010. ^ For photos of the plaque, see Montella, Ernie (June 5, 2004). "Wall of Fame Day in Hatboro, PA". Philadelphia Athletics Historical Society. Retrieved September 23, 2010. ^ Jordan, David M. "Vet Plaques Come to Hatboro". Philadelphia Athletics Historical Society. Retrieved September 23, 2010. ^ "New station, same booth team for A's". ^ "The New York Times Best Seller List - June 22, 2003". Hawes Publications. Retrieved April 23, 2014. Katz, Jeff. "The Kansas City A's & The Wrong Half of the Yankees." Maple Street Press, Hingham, MA, 2006. ISBN 978-0-9777436-5-0.